Sonja Kohn10:50 a.m. Saturday | Updated A prominent Austrian banker who portrayed herself for two years as one of Bernard L. Madoff’s biggest victims was accused on Friday of conspiring for 23 years to funnel more than $9 billion into his immense global Ponzi scheme. The accusations were made in a civil lawsuit that sought damages of $19.6 billion — the sum of the cash lost in a fraud that wiped out nearly $65 billion in paper wealth and ruined thousands of investors on almost every rung of the economic ladder. The central defendant in the complaint is Sonja Kohn, who was the hub of a complex network of European and Caribbean funds that channeled money to Mr. Madoff. A well-connected banker in her native Vienna, Ms. Kohn insisted she never suspected her trusted friend was running a global Ponzi scheme. In reality, according to the complaint, she knowingly raised billions of dollars in cash to sustain Mr. Madoff’s fraud in exchange for at least $62 million in secret kickbacks — payments she insisted be handed over face to face and never put in the mail. The lawsuit says that her collusion was so pivotal to the fraud that Mr. Madoff tried to destroy evidence of their connection before his arrest in 2008. The civil complaint against Ms. Kohn was part of a fusillade of litigation filed in federal bankruptcy court in Manhattan during the last month by Irving H. Picard, the trustee trying to recover assets for victims who sustained cash losses in the fraud. The trustee has until midnight Saturday — the second anniversary of Mr. Madoff’s arrest — to file any lawsuits seeking to recover cash withdrawn from the Ponzi scheme before its collapse. Mr. Picard has recently sued more than a dozen major banks, including UBS and HSBC, which served several hedge funds that invested with Mr. Madoff; Citibank and Nomura, among seven banks that sold derivatives linked to Madoff feeder funds; and JPMorgan Chase, Mr. Madoff’s primary banker during the years of his fraud. The banks have denied any responsibility for the fraud. On Monday, Mr. Picard filed a sealed complaint against business entities connected to Fred Wilpon, the owner of the New York Mets baseball team, but confirmed that settlement negotiations were under way in the case. In a statement, Sterling Equities said that the baseball team would have all the resources it needed to “fully compete and win” regardless of the outcome of the talks. Hundreds of lawsuits have been filed against other investors who withdrew fictional profits from their Madoff accounts over the years, but Mr. Picard said on Friday that he intended to dismiss any complaints filed against investors who could qualify for a “hardship” exemption based on their financial circumstances. All told, Mr. Picard has filed lawsuits seeking to recover more than $50 billion in cash — much more than the approximately $2 billion he has so far recovered. Many of these cases will be hard-fought courtroom battles that could last for years, but some defendants are known to be negotiating possible settlements. While it is difficult to estimate how much of that $50 billion Mr. Picard may ultimately recover, even a final recovery of just $10 billion — which people familiar with the settlement talks say seems feasible — would provide 50 cents on the dollar to those with cash losses. That is considerably more than seemed possible in the weeks and months immediately after Mr. Madoff’s arrest. That will be little comfort for the thousands of investors who are not eligible for compensation because they withdrew more from their Madoff accounts than they had invested. Similarly, thousands of investors whose money was channeled to Mr. Madoff through feeder funds are still uncertain about their status in the bankruptcy case. That issue is one of many knotty questions that remain to be resolved in court. But even in a crowded court docket, the civil complaint filed Friday against Ms. Kohn stands out — both for the size of its claim for damages and for its stark accusations of criminal behavior. “In Sonja Kohn, Madoff found a criminal soul mate, whose greed and dishonest inventiveness equaled his own,” said Mr. Picard, the trustee. The complaint did not disclose where Ms. Kohn was currently residing, and her lawyers in Vienna did not respond to several requests for comment on Friday. But in previous statements, Ms. Kohn has denied all accusations that she was complicit in Mr. Madoff’s fraud. Both Bank Austria and its current owner, UniCredit, Italy’s largest bank, are named as defendants in this lawsuit — which cites their ties to Ms. Kohn — and in the earlier complaint filed against HSBC, the global bank based in London. UniCredit said in a statement on Friday that its policy was not to comment on litigation but that it intended to vigorously defend itself against the accusations made against it and its Bank Austria unit. The 157-page complaint claimed that about half the Ponzi scheme’s stolen funds — $9.1 billion out of an estimated $19.6 billion — was directly attributable to Ms. Kohn, her family members and their elaborate portfolio of feeder funds. The amount makes “these actors arguably the single most critical building block — the ‘sine qua non’ — of the Ponzi scheme,” said Timothy S. Pfeifer, a partner at Baker & Hostetler, the trustee’s law firm. The lawsuit is the first brought by Mr. Picard to include accusations that defendants violated the Racketeer Influenced and Corrupt Organizations Act, a federal law originally enacted to combat organized crime. Better known as RICO, the statute is a powerful tool that provides a means for corralling far-flung but interconnected entities into a single lawsuit. It also permits the recovery of triple damages. A self-made woman, she was a well-connected banker in Vienna and a tireless navigator of the quiet oceans of wealth flowing through European society. With a bouffant red wig and a combative personality — and armed with fluency in four languages and a gilded Rolodex of socialites, industrialists and financiers — she stood out in the conservative world of European private banking. “She characterized herself as ‘Austria’s woman on Wall Street’ and the gateway to Madoff,” the complaint said. 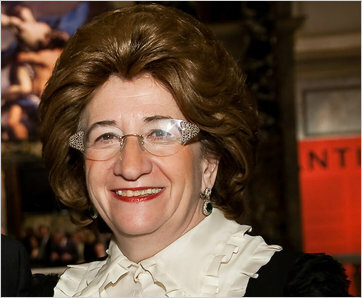 Ms. Kohn first met Mr. Madoff in 1985 when she was living in Monsey, N.Y., and working as a stock broker at Merrill Lynch. She was introduced to him through an executive at Cohmad Securities, a Madoff-related brokerage firm that has also been sued by Mr. Picard. In 1993, Ms. Kohn left New York and returned to Austria to tap the rich vein of European wealth for Mr. Madoff. The lawsuit asserts that Ms. Kohn knew from the beginning that Mr. Madoff was a fraud, and that she received secret kickbacks from him in exchange for feeding him cash from other investors. It contends that she had a secret agreement with Mr. Madoff in which he paid her a flat fee — usually more than $6.5 million annually — to solicit investors for him. “No Ponzi scheme can survive without a constant influx of fresh capital” and Ms. Kohn’s enterprise “provided a flood of cash for Madoff,” the trustee asserted in the complaint. In 1994, Ms. Kohn formed Bank Medici, an Austrian bank that the trustee contends was nothing more than a conduit set up for the sole purpose of funneling money to Mr. Madoff through several feeder funds, including Harley International, the Herald Fund and the Primeo Funds. Bank Medici was 25 percent owned by Bank Austria, and the trustee claims in his complaint that it was effectively a “de facto” branch of the country’s largest bank. The association with Bank Austria gave Ms. Kohn and Bank Medici an imprimatur of legitimacy when recruiting investors, the trustee asserted. The complaint also claims that Mr. Madoff kept secret records of his dealings with Ms. Kohn, hiding them from other people at his firm and destroying them before his confession and arrest. Some former employees kept copies of the records, which listed the specific accounts that Mr. Madoff attributed to Ms. Kohn, it said. According to the trustee, Ms. Kohn took great pains to distance herself and her family from the Ponzi scheme. Neither she nor her relatives ever established a direct account with Mr. Madoff, the complaint said. As the Ponzi scheme neared collapse in the fall of 2008, the feeder funds controlled by Ms. Kohn began making large withdrawals from Mr. Madoff, the trustee said, including a single $423 million transfer just one month before federal agents arrested Mr. Madoff. In the months before the fraud’s collapse, Ms. Kohn and her husband planned to move to Switzerland with stolen proceeds, the complaint said. For some years, Ms. Kohn had spent a considerable amount of time in Switzerland, a common hunting ground for private bankers. But she was also able to penetrate successfully another close-knit milieu there, newly rich Russian oligarchs. After she went into hiding following Mr. Madoff’s fall, other bankers suggested it was because she feared retribution by her Russian clients. The trustee’s complaint asserts that Ms. Kohn has not traveled to New York since Mr. Madoff’s arrest. Several members of her family, including her husband, her mother, a son, a daughter and two sons-in-law were also named as defendants in the lawsuit. According to the complaint, several of them invoked their Fifth Amendment rights more than 100 times during depositions with the trustee’s lawyers last year. Verfasst am: Sa Dez 11, 2010 7:41 pm Titel: Is es möglich? Schreck laß nach, das schaut aber jetzt schon so aus, daß der titoistische Negerramler sich bereit macht, per hochkanten Hinausflug das Reich der Mitte verlassen zu müssen. Er tut schon wieder seine Heißluftprodukte auf Englisch unters Volk verstreuen. Hoffentlich hat er bei seinen Annäherungsversuchen bei chinesischen Kamelstuten nicht zu viel Aufsehen erregt. Könnt ja sein daß er mit heruntergelassenen Hosen bei seinen Kreuzungsversuchen derklatscht ist worden. Die grinsende Menschheit wird es ja erfahren müssen, ob der Gscheitl wieder seinen Mist bei uns abladen wird. Auf der anderen Seite ist's ja wieder nett, wenn wir mehr über das "Soldatenschicksal im Dritten Reich", speziell was KZ-Wächter betrifft, erfahren dürfen. Jessas Maria, ist die aber schiach. Schaut ja fast aus wie ein Mann in Weiberkleiderl. Und was ist mit der Schottermitzi in der Geisterbahn? Entweder derschrecken sich die Leit so stark, daß der Leichenwagen an Parkplatz beim Ausgang von der Geisterbahn kriegat oder auf der anderen Seite das Wagerl von der Psychiatrie um das was lebendig herauskommt schnell zusammenzufangen. Was die alte Schreckschraube aus dem Muzicanten seinem Freundeskreis betrifft ist ja gut, daß nur etwas von der oberen Partie abgebildet wurde, a ganzes Bilderl von der hätt sicher den Antisemitismus weiter verstärkt. Von mir hat diese Schwuchtel kan Cent. Habe lieber alles versoffen. Ist wesentlich sinnvoller.